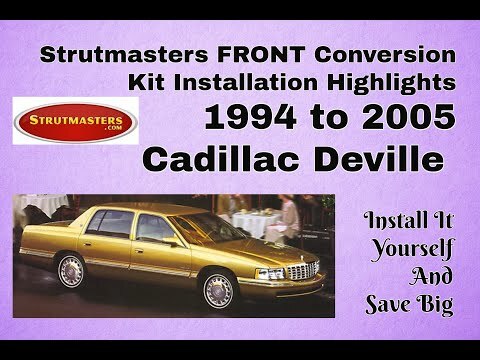 1997-1999 Cadillac Deville 4.6L Deluxe 4 Wheel Air Suspension Conversion Kit With Resistor (CD44FR) is the perfect solution to your air suspension problems. Designed to be very affordable, you can convert your air suspension to use standard. 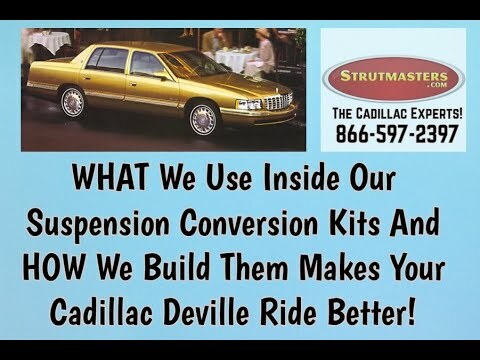 Strutmasters' air to non-air suspension conversion kit saves Cadillac Deville owners time, frustration, and money when the air suspension system goes bad. Customers are impressed with the quality of the parts and the low price of the kit. Manufactured in America, the kit comes complete with two pre-assembled front struts with premium springs, two premium rear coilover shock absorbers, and two premium Eibach coil springs. The kit is a direct replacement, so no modifications are needed before it's installed. Detailed instructions and online installation videos help guide a smooth repair. The kit is installed in as little as one hour per wheel. If further assistance is needed, Strutmasters' ASE certified experts offer technical support over the phone. But the low price of the kit is what typically seals the deal; the kit costs a fraction of the price of dealership direct replacement and individual part replacement. 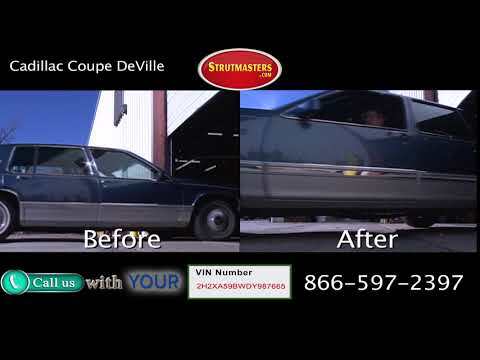 How Do I know If My Deville 4.6L Air Suspension is failing? A 1997-1999 Cadillac Deville will display specific symptoms if its air suspension system is leaking or going bad. Look for an inability of the Deville to maintain the proper ride height. A sudden height variance between different sides of the Deville is also a red flag. Typically one end will sag while the other end is inflated. This gives the illusion the Deville is ‚Äúsquatting down‚Äù in the rear. There might be a shifting lean from side to side. These imbalances will wear out the air compressor by placing excess strain on it. If the air compressor has ceased working or is running too often then suspension failure will advance further. An illuminated suspension warning light on the instrument cluster points to a suspension issue that should be fixed promptly. 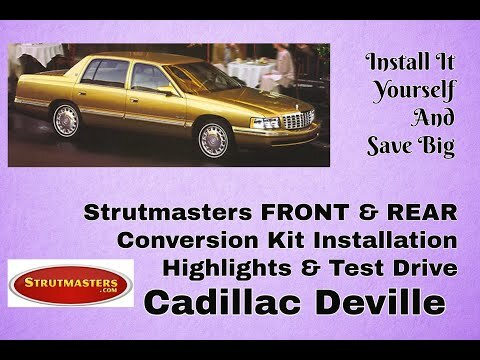 Ok, so after looking around for replacement susp on my 98 Deville air-ride I came across Strutmasters, which seems to be a legit option to get my baby on the road running smooth. Wrong!! I’m driving it again, but I didn’t plan on spending almost 800$ on a 4-wheel convo kit that feels like I traded my 98 caddy for a 99 cavalier. Overall ride, feel, handling is just far, far inferior to Cadillacs original design. Basically these cars are too heavy for the slightly better than Napa grade struts you get in the kit. Seriously, for the money just keep saving up and buy OEM instead.. If you dont care about ride quality and just wanna get back on the road cheap and fast, then by all means, shell out the dough, and if you cant do it yourself, good luck finding someone to install this without spending a small fortune. I applaude the idea here in trying to eliminate the air ride systems, but factory engineers know what they are doing, and they put air-ride on for a reason. Because it works.